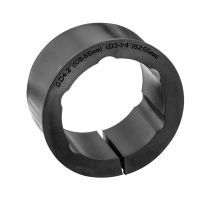 Raise your router fast with the Quick-Gear, then down-shift to the precision gear for fine adjustments—Snap-Lock insert ring for easy bit changes. 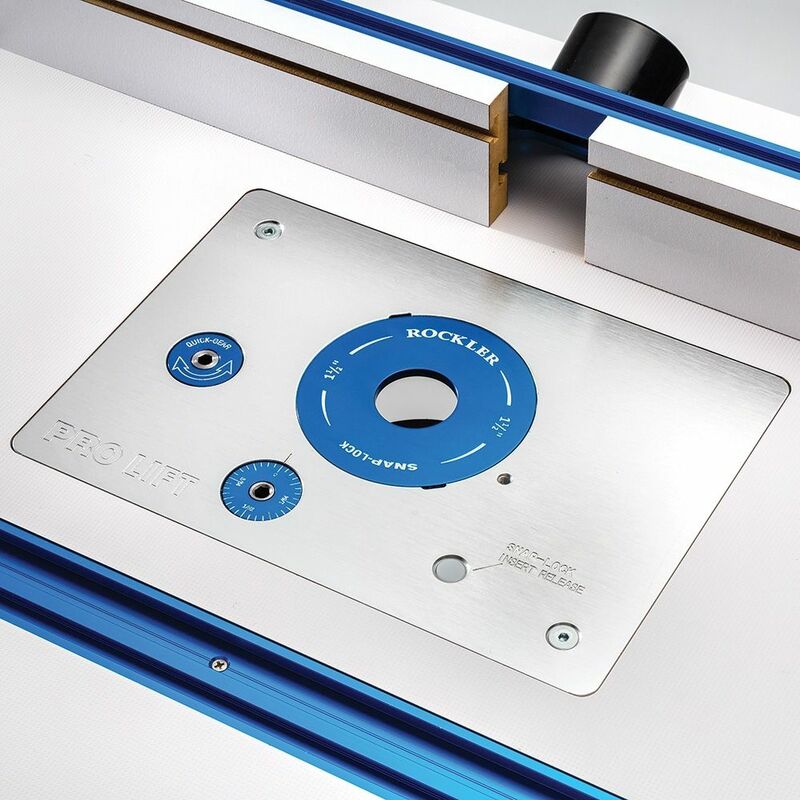 Fits Rockler and Bench Dog router tables. 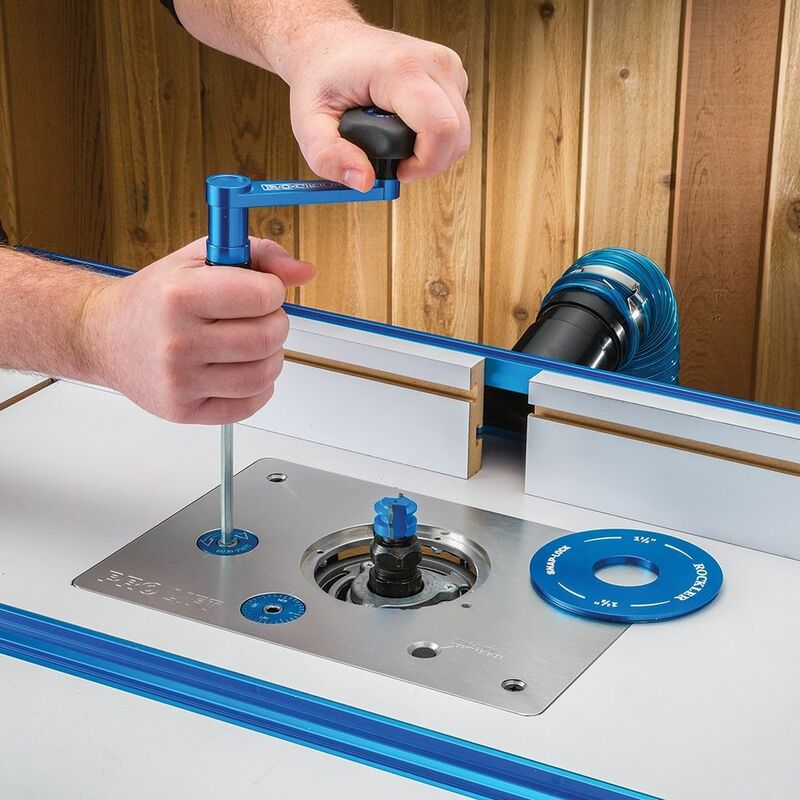 Two patent-pending features raise the Rockler Pro Lift into a class of its own: ultra-fast ''Quick-Gear'' height adjustments and ''Snap-Lock'' tool-free insert ring changes. Push the button to release the insert ring, then wind the Quick-Gear to raise the bit above the table in just seconds. Once the bit is installed, quickly lower it, click in the insert ring, and use the fine adjustment gear to set the final height to within 0.001''. 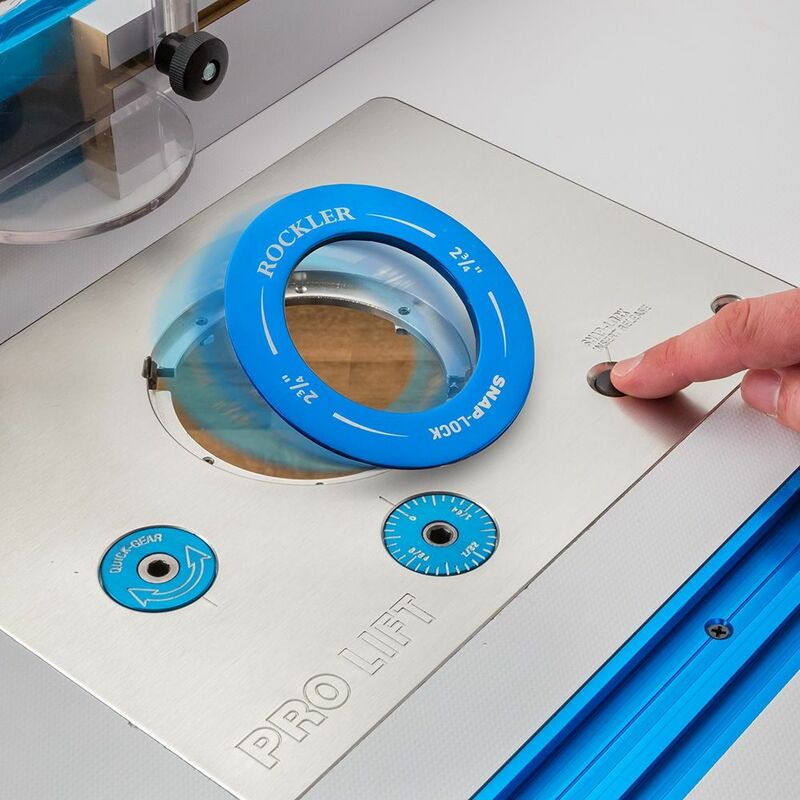 All this is achieved more quickly, more efficiently, and more intuitively with the Rockler Pro Lift. Raise your woodworking to a new level. 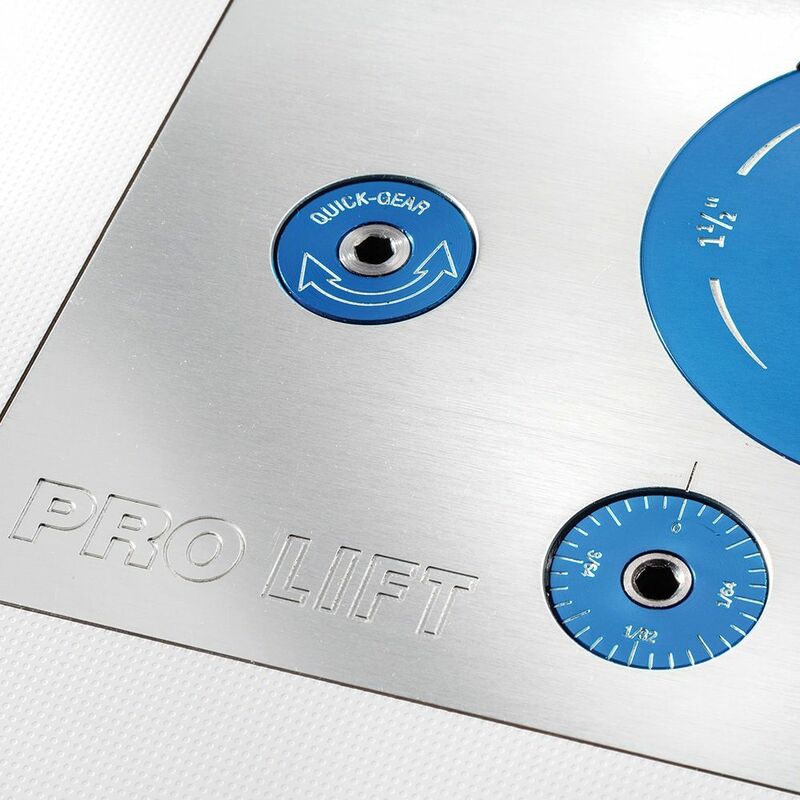 The Pro Lift accepts router motors with a 4.2'' diameter (13.85'' circumference). Examples include the Porter-Cable 7518 and 7519. Optional adapters (listed below) are available to mount routers with smaller motors. If you are unsure of your router motor's diameter, check the manual, or measure the circumference with a tailor's tape. Measuring the circumference is easier than measuring the diameter. 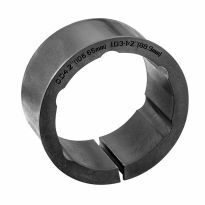 The optional collars have an expansion gap, so they will accept motors measuring 1/8'' larger or smaller in diameter than the listed spec. I have always wanted a router lift, my wife was so nice to get this for me for Christmas. I just went to put it together and the lift would not raise or lower, it was bound up. I took it in to the Denver Rockler location and they exchanged it with no questions just scratching their heads since this was the first incident they have seen. I love Rockler!!! Just unboxed it - looks and feels really solid and tight. The only thing I noticed was the scale on the "fine" lift ring. The rate of lift is 1/8" per full turn of the crank, but the scale readings are for 1/16"-so you'll have to double what the readings are on the scale. Installation was easy and the using it is a leg saver. I've been looking for a lift system for a while. When I saw the Rockler lift, it has everything I was looking for. I've been using it for a couple of days now. I'm completely satisfied with with all aspects and would recommend it to others. Exactly what I hoped for. This is an excellent addition to my Bench Dog table. Solid and heavy but operates very smoothly. Fit perfectly into table opening and my Porter Cable 7518 slid into the housing easily. Love the two options for height adjustment. One note: comes with 1 1/2 inch snap lock ring—too small for most of my bits. Hoping for larger options soon. If tightened up, I am assuming completely, it won't work. I feel it may be too loose to hold the router under or when used. Works as advertised, but when I was installing, clamped the router in tight, the speed lift would not work. After replacing, did the same with the new one, kept messing with it and realize what I had done. Loosen and now it works fine. Needs to be a warning in the setup instructions not to over tighten the router. The installation required grinding down the leveling sub-plate to get it to fit into the plate opening. It luckily had just enough material to grind down without grinding into the leveling bolt. Not a big deal, just was not expecting this complication. I have just installed the plate in my router table and have not had a chance to do my first project but i'm looking forward to the new level of fine adjustment. Great lift. It took a while to tweak it to being flat. I bought this router lift as a returned. I would have bought an unopened one but I live an hour and a half away from my closest rockler store and this was the only one they had in stock. I don't know if it comes out of the box assembled or if the previous owner assembled it but out of the box it was not flat. I bought the phenolic plate to go with it and I could not get the plate to level with the table...the furthest right hand corner would sit high no matter what I tried. I found that if I dropped the mount all the way down it would flatten out. (Checked with a machined ruler) so I loosened the two posts just enough for them to realign them selves by running the mount up and down a few times. It worked until I put the router in and tightened it...had to do that all over again with the router in the lift. I eventually got it within .004 inches of being flat...perfectly fine for wood working but just irritating to have to put up with. This also helped with the ease of using the "quick gear" it's just hard to get started lowering from it being all the way up. Before hand I couldn't run the router all the way up for fear of breaking something as other reviews mentioned. Now I can. After dealing with that, I've gotten to run some wood through it and it works great. Yes I do recommend this lift. I bought one these units. I installed it on a Benchdog Pro-Top. To do this you have to remove a piece of the metal frame on the left side of the machine. Since I intend to keep the lift regardless of what happens to the Benchdog I was okay with that. It takes about 10 minutes to do with a rotary tool and a cutoff wheel. They lost star is due to two things. A) Only the 1.5" I.D. plate. Rockler needs to release more sizes ASAP. B) The quick height change gear box is hard to get started. It almost feels like you are going to end up the breaking the thing. The micro-adjust is as smooth as butter! Yes, I will keep this in my shop. Yes, I recommend this router lift. I would have given 5 stars, but I had to modify my Bench Dog cast iron router table saw extension to clear the 4:1 gear reducer on the Pro Lift. 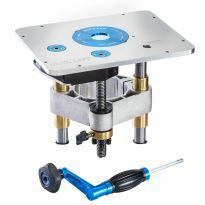 The Bench Dog cast iron router table has 8 leveling adjustment screws, 4 in the corners and 4 in the middle of the sides. I had to saw off the left middle side adjustment tab and screw. The reason is that the tab on the table is 1/2" wide and the gear reducer on the bottom of the router plate is only 1/4" in from the edge of the plate. But it still works well without the 8th leveling screw. The top plate is 1/2" thick and is plenty stiff to not deflect without this 8th leveling screw. Now, I only need the additional insert rings so that I can use larger bits (the Pro Lift comes with one insert ring with a 1-1/2" hole). I know Rockler has them designed even though they are not yet available as it clearly shows one with a 2-1/2" hole in the latest catalog. 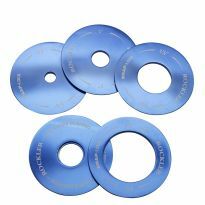 I need those new insert rings of various sizes now so I can get back to excellent-to-perfect-to-outstanding production now! My new 3.25 hp motor wants to flex its muscle now. My router motor required a 3.5” adapter collar. The adapter, being a non-metallic material, adds a degree of sponginess to the motor clamping system and makes it possible to overtighten the clamp as it squeezes the adapter. When you overtighten it causes binding in the guide rods and cancels the lifting capability that you paid for. If you loosen the clamp to regain lifting ability the motor can slip in the clamp just by pushing on the top of the motor. This is a design weakness (in my opinion). I made several readjustments to the clamp until I found a happy medium that seems to hold the motor securely AND allowed free travel of the lift. But I will always have a fear that the motor will slip its position and ruin a cut. I think if your router motor diameter is large enough to not need an adapter this lift might work better because you would eliminate the additional clamp squeeze. If your router motor is small enough to need the thicker 3.25” adapter it will add even more sponginess to the clamp and your lifting problems will be bigger than mine. Just something to be aware of when choosing a brand. Not sorry I bought this but there's room for improvement. As with other reviewers after installing the router the quick gear would bind when it reached near the top of the lift. Loosening and re-tightening the shaft mount screws (which the installation instructions are missing) helped but slight binding still exists. Using the fine adjustment when the lift is at the top of its run works fine. The other issue was getting the plate to sit flush and level in the High Pressure Laminate Router Table Top I bought. I guess if you go cheap you get cheap. The problem there was the table sagged in the middle by about a 1/16th of an inch. After I shimmed the table top to take the sag out I was able to adjust the plate accurately. Now that everything is installed the lift works adequately and I do like the quick release insert ring. This does make changing bits and quickly/accurately adjusting router height much easier than my old router table set up. I bought the lift for the benchdog pro contractor router table. The plate does not fit. I had to cut the metal and the leveling screws to make it fit . The plate is not properly spaced to fit the table so it required a lot of metal cutting. Once that was done it worked fine. So, I purchased this lift after looking at every lift out there. I really wanted a lift that allowed you to release the router quickly via an over center clamp, etc. I called Rockler and the nice representative took the time to go and physically look on the lift to see if this was possible. He returned to the line and related that yes, it had a quick release for the motor. Well, when I received it this in fact was not the case. The router mounts with 2 hex cap screws. In addition, with my PC890 you also have to remove the linear gear from the router motor. So, my #1 criteria equalled a total fail. Since I didn't have time to mess about I installed the lift anyways. The quick release insert works very well. The quick change gear feels quite rough and it almost feels like I'll break the mechanism or it will wear out quickly. So, from day one I basically only use the micro adjust location to change the height. Not a big deal, but overall- meh. Raising and lowering the router is difficult the last inch-inch an half as the shafts it rides on are binding. Call support and they indicated a step was missing in the instruction. They sent missing step and followed them and unit still is binding. Believe I will return unit for a replacement to see if ist has the same issues. If so, will return for refund. Seems to be the simplest approach for the custom table I am building. To provide a good top setting lift to my router table. I have knee problems and this makes life a lot easier. Because I have always liked Rockler products and business. It fits my existing rockler table. I have also read good reviews about this product. I own a Rockler HPL Router Table and want to add the Final Upgrade to an Excellent Product. Christmas present for one of my employees. Saving setup time is always important. I have ideas to incorporate this into my main table, having a router available at the turn of a handle just seems logical! Will work better for what I do. I saw it in action and liked what I saw. Saw it demonstrated at Rockler in Spring during the VIP event. Cannot wait to try this out on my new Bench Dog ProMax router table. Newest lifter out there. How large of bit can be used ? 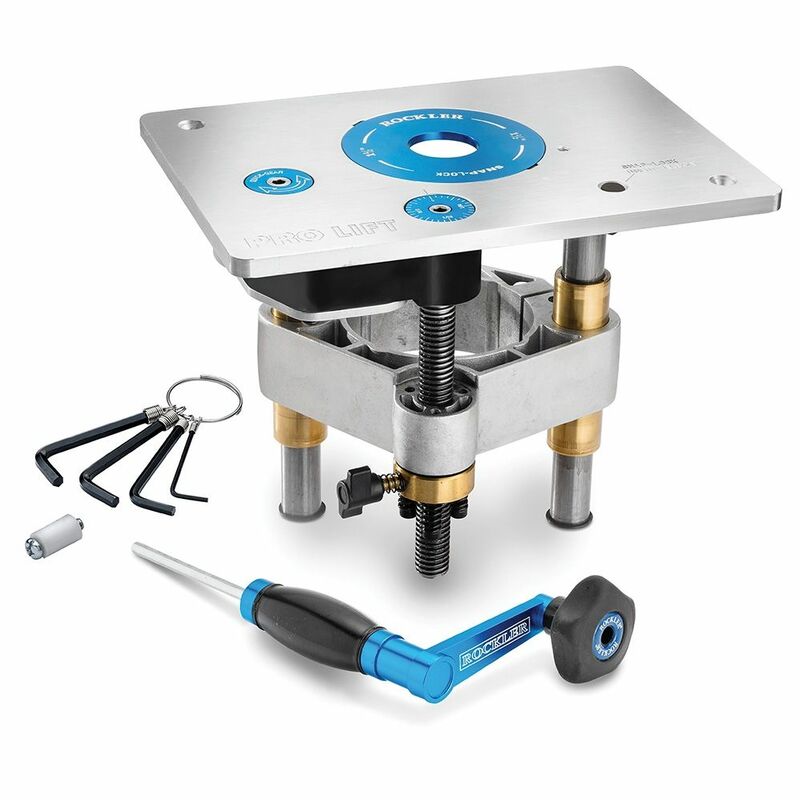 Will this work with the Bench Dog ProTop Contractor Portable Router Table? Yes. I also bought the Rocket Dust Bucket so I had to remove the front door to the Bench Dog table, but the lift works great with the Bench Dpg table. BEST ANSWER: This lift wants a lip on the left side of the opening in your table that DOES NOT exceed 3/8" wide, to accommodate the gear housing. Of course, if you've got tools that can saw and grind the offending projection to make room for the lift, nothing is impossible! 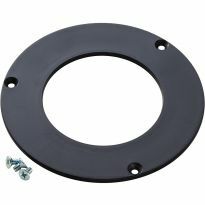 As for the second part of your question, this lift will require one of the adapter rings (#57022 to be exact) to size it down for the Bosch 1617, or any router with a round motor housing 3-1/2" in diameter. There's another ring (#50098) that fits Makita and others with smaller 3-1/4" motor housings. I have a Bench Dog Cast Iron Router Extension for my table saw. I had to use a hack saw to cut out the leveling tab on the middle left side of the cast iron table for this lift to fit. It only took about 5 minutes to do. Then it fit perfectly. The loss of one leveling tab isn't critical because this lift has a 1/2" thick top plate.instead of the 1/4" standard Bench Dog mounting plate. If there is a protruding side tab on your router table top it will not work. The housing on the pro lift allows for 1/4” inset on left side. Can this fit my 9" x 12" (exactly) table opening ? BEST ANSWER: The plate dimensions are 8-1/4'' x 11-3/4'', so it would "fit" inside the opening, but you would need to fill in some gaps. can I get other insert rings? BEST ANSWER: Watch for a full selection of insert rings, available in late spring to early summer, beginning with the zero-clearance insert. Will this fit a Bosch RA1181 and a Bosch 16!7 router? My (Rockler) router table has an opening for an 8 x 11" plate. Is there a lift system that will accommodate? BEST ANSWER: Rockler has a template guide along with a half inch pattern bit to expand opening on older tables to 8 1/4 x 11 3/4. 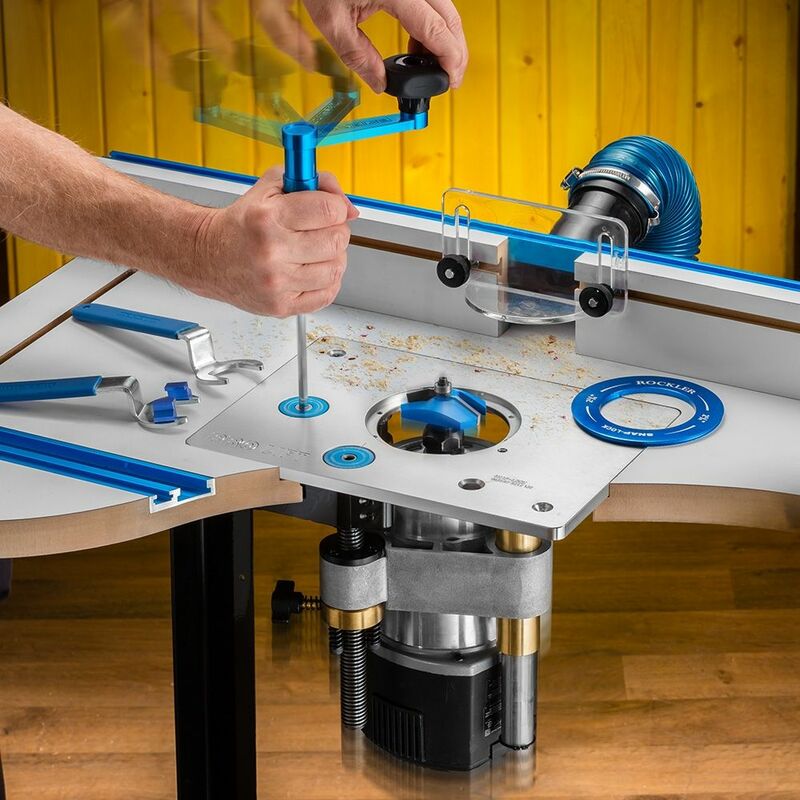 Will it fit the Kreg router table without modifications? BEST ANSWER: No, the item number 52429 will not. However, they note that the Pro Lift Router Lift (Large Plate) that's coming soon, fits 9-1/4" x 11-3/4" which would fit the Kreg table. hello! I would like to know if , it works well with router makita RP2301 ? I'm interested in this lift. I have a Ridgid router. Will this work with it. I took a measurement of the circumference and it says 11.25", or a 3.58 diameter. Would I be able to use one of the adapters? I ask understanding the sizes, but wanting to make sure this would work before I pull the trigger on the money side of things. 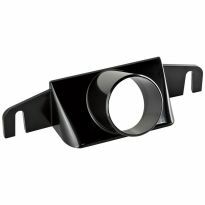 BEST ANSWER: From what I read above, the 3-1/2'' Pro Lift Adapter Collar (#57022) should be the right fit for your router. Will the pro lift work with a Bosch model RA1171 router table or would I have to modify the table? will this fit a Milwaukee 3-1/2 hp model m5635-20 router. seems to measure 13 round 4" across ? BEST ANSWER: They offer two(02) adapters for use with just about any round body router. Check the Rockler catalog for the adapters as they mention which adapter is used for whatever router. Has Rockler come up with a set of accessory plate inserts for this router lift mechanism? It comes with a 1 1/2" insert, does Rockler have larger opening inserts available yet? 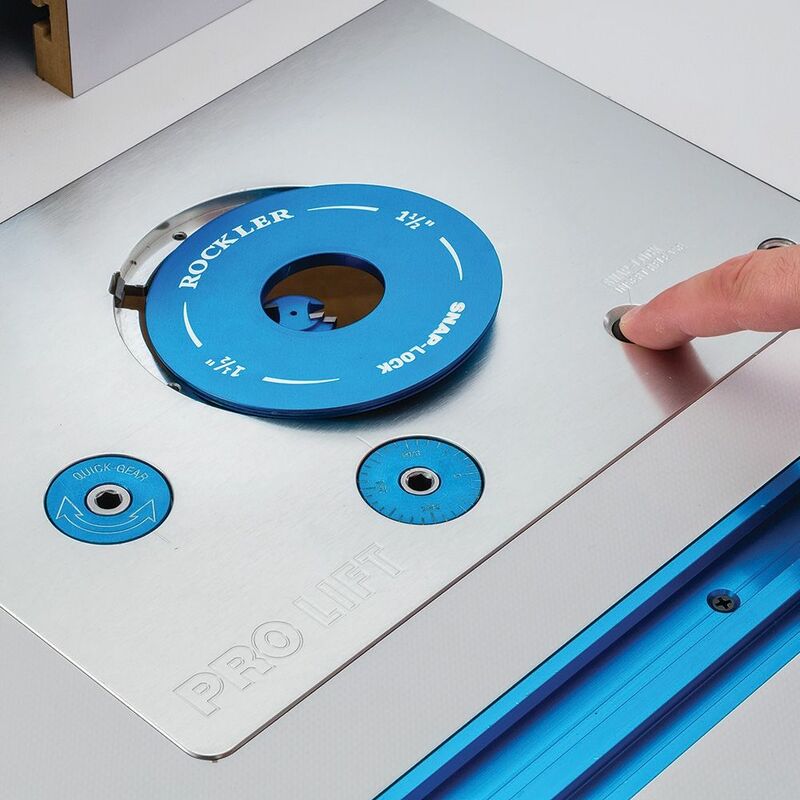 BEST ANSWER: Additional inserts, in a variety of sizes, will be available for the Rockler Pro Lift within approximately 90 days. Do the height adjuster screws have a hole all the way through so that dust does not fill them up stopping the adjuster handle from going in until the dust is blown out? 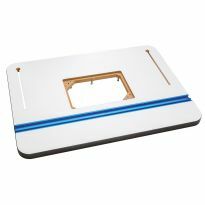 My mounting plate on my router table is 12" x 9" is there any lift system that would adapt to this size ? Is this plate anchored to the top or relies on gravity to hold it in place? I'm looking for a router plate for use in a top that will swivel to a horizontal position. BEST ANSWER: There are mounting holes at the top left and bottom right. Not sure if just two screws will be enough to support the weight of the lift and router in a vertical position. You will probably have to drill additional mounting holes to accomplish the vertical position. I mounted my lift in a 1" hardwood table top and added leveling hardware so the two mounting screws are to keep the lift from shifting and not for support. Hope this helps. The plate comes with 2 anchor holes that are predrilled and counter sunk for screwing down. If these turn out to be in the wrong place one could easily drill and countersink where needed as long as did not interfere with lower parts. Aluminum is easy to work with. Hopes this helps. Two bolts hold it to the table, whether it would maintain stable placement with tilting would depend on the strength of your table and handling when tipping. Should though , I think. It has screws for anchoring and leveling. The screws wouldn't have to be used. It very efficiently uses gravity to hold it in place. Has anyone had a problem raising and lowering their router? The handle gets very hard to turn when you lift or lower? The higher the router is goes the harder it is to turn. BEST ANSWER: Yes, I too had this problem. My lift is using the adapter sleeve, when tightened down it actually pulls the three arms in out of alignment. I solved this by wrapping my router 1-2 wraps with duct tape. Then put the sleeve over that, reinsert into router lift tighten up. That should solve your problem. Same here, only way to make it work. Tickler needs to warn people or fix the problem. Many people are going to have this problem. Sounds like a design flaw that wasn'r revealed until the unit got into the hands of users. From the other questions/comments here, it seems like it's a particular problem for those that use an adapter for smaller diameter routers. The frame has a torque or torsion weakness that causes the lift to bind because the struts get out of parallel in certain uses or tightness of the router clamp. I hope that Rockler engineers find a design tweak to resolve this issue, because it looks like an awesome lift. I'm interested in it, but for nearly $400 it has to work right. I had a similr issue. I have a Bosch and had to use the Collar insert not sure you have that version but if you do the problem is you can over tighten and this will cause the router not to lift or hard to lift. I had to back off the holding bolts on the collar a bit and it worked great. Even if you dont have to use the collar if you tighten the blots to much it wont rise. You may be trying to raise the router high enough to get the collet above the table. It is not designed for that. I have encountered the same thing and will be getting a set of Rockler cranked collet wrenches. Thanks George, I’ve already did the same. Although I still think it should go to the top. No restrictions, a lift is a lift. You buy it to lift the router, you should not have to buy something or create a work around to make it work. It costs to much to not expect it to work properly. Thanks, Rick. I have noticed that it turns harder than I expected but since you don't have to lock the height in place figured that may be the reason. It hasn't been a problem for me, just harder than I expected. I just snapped the gear today. The standard gearing will lift and lower but the “Quick Gear” just spins. Talked to Rockler and they are sending me a new one. The customer service is outstanding. What would be a good router to use with this lift if I plan to dedicate it to a router table? Porter Cable 7518 variable speed 3-1/4 hp motor ONLY. 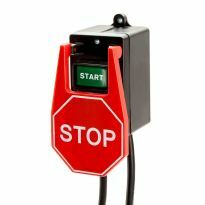 I got the following answer from someone else: "Porter Cable 7518 variable speed 3-1/4 hp motor ONLY." I use a 7518 porter cable and it does a fine job . will this work with rocklers pro lift#52429? BEST ANSWER: Yes, I have both items and the RTJ400 works just fine with the Rockler Pro lift. You will need to order the correct insert for the the router lift (which is sold by Rockler) so that the RTJ400 bushing will fit. 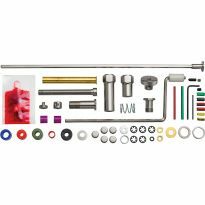 When you install the new insert and bushing you will need to make a reference mark on the insert so that each time you use the Leigh bushing you will be starting at the correct position of the insert. Instructions on how to do this are given in the RTJ400 instruction book. I've use the combination of the Router lift and the RTJ400 on several drawers with very nice results. The router jig should work with any router table. 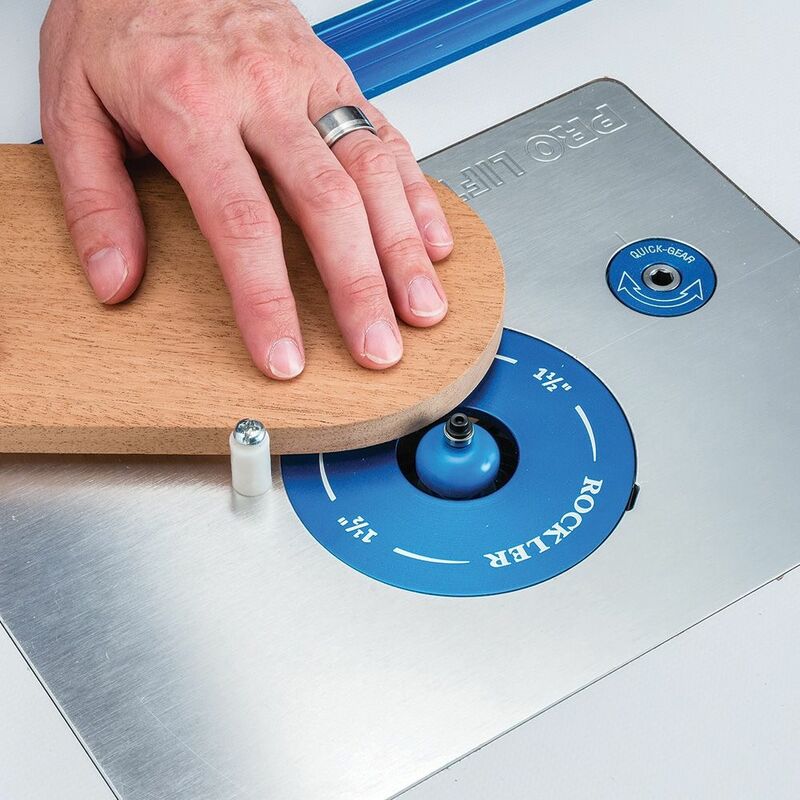 Has anyone else had problems levelling the rockler pro lift router lift plate ? They messed up by not having 4 mounting holes. 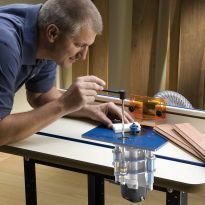 BEST ANSWER: Use the Rockler router table top and that should make your leveling a little easier. ROUTER LIFT MOVES WHEN USING. hOW DO I STOP THIS? BEST ANSWER: By "moves when using", I assume you mean the bit height changes slightly due to the vibration of the router?There is a locking thumbscrew on the base - once you set you bit height, you can lock this... that should keep it from having any movement. Tighten the thumb screw that is located on the left rail after you set your height. Will this work with a Sawstop table saw? Can't answer your question specifically, you'd have to contact SawStop directly. I'm answering this to give you something else to think about. I bought a SawStop a year ago with the 52' fence extension. What I did was remove the black extension table, Installed a wood frame to hold Rockler's router table that had a cutout for the Prolift. With the router table being orientated 90 degrees to the way SawStop did theirs I can push long pieces of wood through the router table and use the rest of the table saw as an outfeed table and support the wood. Work with? in what way do you mean? ... if you have an extension table on it that accommodates a 8 1/4" x 11 3/4" router lift, then yes. I have a Rocker router table that I just purhased from an estate. The non adjustable router plate measures 11 x 7.9375 Is there a version for what appears to be the older / non standard size? Thansk..
Is there a cutting / routing template for this unit ? I am building a work area for my router. BEST ANSWER: Rockler item 20956 is the correct template for inserting this lift. Will this work with the Kreg router table? BEST ANSWER: When I purchased the pro lift, the opening in my table was too small. I positioned the plate where I wanted it and secured strips of hard board to the table with double-sided tape - tight to the plate. I removed the plate and used the hardboard strips as a template enabling me to modify the opening to securely fit the plate. ROUTER MOVES WHEN USING Why? BEST ANSWER: Can you move it by hand? Did you check router mounting configuration? Might need an adapter? Some things to check. What is the height of the lift? BEST ANSWER: The router lift moves 3.25" travel. It is 9" below the plate (depending on your router how much much more). And it uses an area of 8" by 7" below plate with out router in it. Which insert do I use if I am going to be using the Leigh RTJ400 dovetail jig? Will a Triton TRA001 3-1/4 HP Dual Mode Precision Plunge Router fit? BEST ANSWER: No it will not fit nor can it be adapted to fit! BEST ANSWER: The Rockler Pro Router Lift will not accommodate the Makita router.